"Gentle Giant, ST OBI Box Set - 4 CDs"
GENTLE GIANT OBI BOX SET WITH THESE TITLES - GENTLE GIANT SELF TITLED - OCTOPUS - ACQUIRING THE TASTE AND THREE FRIENDS- Japanese OBI MINI REPLICA LP TITLES making a 4 CD Box Set- Japanese OBI MINI REPLICA BOX SET Japanese re-mastered Mini LP replica Limited Edition Collection Recorded from the finest Original Masters available. Each title Comes with anti-static sleeves similar to Vinyl LPs, Cardboard packaging exact to the original LP, Re-sealable plastic wrap cases for protection of each collectible and include extensive Liner Notes Booklet. Actual miniaturized version of the 12" LP in 4" CD version Special VERY RARE LIMITED EDITION BOX SET ONLY PRODUCED ON FUTURES FOR THIS ONE TIME PRESSING -- were only available in Japan. GENTLE GIANT OBI BOX SET WITH THESE 4 TITLES - GENTLE GIANT - Japanese reissue of the progressive rock act's 1970 debut album. Packaged in a miniature gatefold LP sleeve Track Listings 1. Giant 2. Funny Ways 3. Alucard 4. Isn't It Quiet and Cold? 5. Nothing at All 6. Why Not? 7. 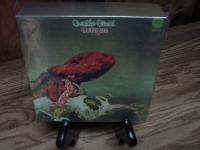 Queen OCTOPUS - Japanese reissue of the progressive rock act's 1972 album. Packaged in a miniature gatefold LP sleeve Track Listings 1. Advent of Panurge 2. Raconteur, Troubadour 3. Cry for Everyone 4. Knots 5. Boys in the Band 6. Dog's Life 7. Think of Me with Kindness 8. River ACQUIRING THE TASTE - Limited Edition Japanese pressing remastered in a miniature LP sleeve. This was the second album released from the prog rock band and was originally released in 1971 Track Listings 1. Pantagruel's Nativity 2. Edge of Twilight 3. House, The Street, The Room 4. Acquiring the Taste 5. Wreck 6. Moon Is Down 7. Black Cat 8. Plain Truth AND THREE FRIENDS - Limited Edition Japanese pressing in a miniature LP sleeve. This was the prog rock band's third CD release in 1972 Track Listings 1. Prologue 2. Schooldays 3. Working All Day 4. Peel the Paint 5. Mister Class and Quality? 6. Three Friends These are Japanese digitally re-mastered Mini LP replica CDs (the OBI Edition). This Limited Edition Collection has only VERY FEW made world-wide and are immediately Out of Print. Recorded from the finest Original Masters available. Comes with anti-static sleeves similar to Vinyl LPs, Cardboard packaging like an LP, includes extensive Liner Notes Booklet. Actual miniaturized version of the 12inch LP in 4inch CD version.